A century and a half before the French Revolution, Oliver Cromwell’s New Model Army proved that nationalist citizen militaries were superior in every way to the elite-led, essentially mercenary, armed forces of the medieval aristocracy. Across the English Channel, the experience of the Thirty Years War resulted in the continent’s choosing of nationalism over Roman Catholic Universalism, and this choice was also partially made because elites had witnessed the power of citizen armies and total war. One hundred and fifty years later, the infant French Republic would be invaded by no fewer than three hostile medievalist armies, but would defeat them all thanks to the unifying nationalist principles that gave every French citizen a stake in victory. The principles of liberty, equality, and brotherhood transformed all of French society, essentially enlarging the scale of complex civilisation to include the entire nation-state, something that had not been fully accomplished since the Peace of Westphalia established the nation-state system at the conclusion of the Thirty Years War. The example of France was quickly followed by her rivals, then by Latin American countries, then later by Germany, Italy, and Japan, and finally by Third World countries. In recent decades, however, the core values of the French Revolution have been inverted to promote a new Universalism, one of individualist, so-called “Western”, consumerism. Another grand struggle, like that of the French Revolution, has begun: on the one side are the United States, the European Union, and NATO who promote the new Universalism cloaked in the symbols of the French Revolution; on the other side are China, Russia, BRICS, the Eurasian Economic Union, and the SCO, who promote nationalism and sovereignty, which comprise the actual substance of the French Revolution. The English Civil War, the Thirty Years War, and the Great Power conflicts of the seventeenth and eighteenth centuries progressively set the stage for the French Revolution and its transformative principles. Each of these was, of course, part of the larger whole of the development of modern industrial civilisation, but each in some way more narrowly involved the expansion of the nation-state and of nationalism. People instantly recognise that the English Civil War had to do with Puritanism and middle-class power, but it takes some reflection to realise that it was also about England’s identity as a nation-state. As Loewenstein and Stevens say in Early Modern Nationalism and Milton’s England, “The triumph of the New Model Army was not only in effecting the victory of Parliament over the King, but also that of the national over the local and feudal.” This was also the result of the Thirty Years War. The Roman Catholic Universalism of the Medieval Ages at issue in that annihilating conflict can best be symbolised by Charles V, the Hapsburg monarch and Holy Roman Emperor of the era preceding. Charles governed global territories, including what would later be known as Croatia, Slovenia, the Czech Republic, Slovakia, Austria, Germany, the Netherlands, Belgium, Spain, and parts of Italy, Switzerland and France. A speaker of five languages Charles V essentially represented everyone and no one at the same time. Opposed to this figure symbolically is Gustavus Adolphus, the King of Sweden during the Thirty Years War. Adolphus reformed the national institutions of Sweden along progressive, nationalist lines. His policies benefited the common people, and they felt an upsurge of patriotism during his reign. The Swedish King was unique in his appreciation of how pursuing the “common good” led to more intense nationalistic feelings and a tighter coordination among a nation’s disparate parts. Those who fought him and afterwards followed him in leading states and armies throughout Europe generally pursued different goals – those of Absolutism (which exploited nationalism, but without actually giving citizens any real stake in the fate of the nation). The contradictions of this would eventually lead to the tumult of first the American and then the French revolutions. Combat operations during the American Revolution stretched from the Saint Lawrence Estuary in the north to Savannah, Georgia in the south – an area larger than Western Europe. What distinguishes this conflict from, say, the Seven Years War of the previous decade is the signal lack of factionalism and alliance-flipping by the rebel forces. The reason for this is obvious. Rebel troops could be trusted to fulfil their missions because The Declaration of Independence had articulated a social-contract through which each soldier stood to gain freedom and popular sovereignty from the victory of American arms against Britain. This social-contract achieved even greater expression in the French Revolution. It was the promise of liberty, equality, and brotherhood that inspired hundreds of thousands of citizen volunteers to join France’s revolutionary armies when the infant republic was faced with simultaneous invasions from several hostile neighbouring states. This inspiration is accurately expressed by Maximilien Robespierre when he addresses France, saying, “Happy is the man who is born in your midst; happier is he who can die for your happiness.” Frenchmen were willing to die for France because the revolution had resulted in their identifying their very being with that of France as a whole. As stated earlier, this essentially broadened the scale of complex civilisation to the national level for the first time in human history. Robespierre was succeeded by Napoleon Bonaparte, who in 1805 coordinated forces in Central Europe, the Mediterranean, the Caribbean, the Levant, and on the English Channel. Frenchmen sacrificed their lives in each of these theatres because they believed in, and highly valued, the reforms Napoleon had brought into effect. His legal code, education system, and military innovations wove together the entire French nation-state, resulting in fifteen years of victories whose power and consistency could not escape the notice of others around the world. Napoleon was followed by emulators in Latin America, Haiti, Russia, Italy, Germany, and Japan. Nationalism became a component of every ideology arising out of the latter 19th Century, including the ultra-nationalist zealotry of fascism. Nazi Germany’s appeal to race as a basis for political devotion was a means of increasing still further the scale of national coordination and integration, to go beyond mere nation-states to that of shared ethnicity (i.e., the Aryan race, which could unite all “Germanic” peoples around the globe). In a sense the Nazis were pursuing a perverted version of the French Revolution (offering liberty, equality and botherhood to Aryans, regardless of their nation-state affiliation). Thus they were approaching a new Universalism, one that would have to achieve “universal” reach on the entire planet through ethnic cleansing. This project turned out to be a failure, but in the post-World War II era an alternative Universalism was then pursued by the United States of America. This was the Universalism of so-called Western values – liberalism and individualism to the exclusion of sovereignty and the nation-state system established by the Peace of Westphalia, which established in international law that nations are sovereign within their own borders and cannot be interfered with by outside forces. The United States and its colonial underlings (for example, the European Union with NATO as its fighting arm) have attacked the Middle East, Libya, Russia, Iran, and China. In this assault the empire has used propaganda appeals to the liberalism (i.e., liberty and equality) but not the nationalism (i.e., brotherhood) of the French Revolution. In fact, the US has acted in the last half-century to promote a kind of new brotherhood, that of the global citizen. What this New World Order aims to accomplish is, of course, the subjugation of the planet’s population for globalized capitalism. Arrayed against this new Universalism (which has resorted to a “cleansing” every bit as deadly as the Nazis’, just not on overtly ethnic grounds), are what might be called the new defenders of those principles victorious in the Second World War and, by extension, the French Revolution. These defenders are Russia, China, BRICS, the Eurasian Economic Union, and the SCO. If one reads the speeches of Vladimir Putin and Xi Jinping one can easily see that they insist upon national sovereignty (brotherhood) and also on liberty and equality. Given this, the French Revolution deserves to be understood rightly by all fighting for a multi-polar world. This is so because the revolution’s ideas and values are severely manipulated today; moreover, they are actually promoted by the so-called enemies of “The West”. In Russia, the phrase applied to the ideals of the French Revolution is “Communitarian Democracy” which is defined as “material welfare, freedom and fairness for all citizens, social groups and nationalities”. As is apparent, this is liberty, equality and brotherhood, just in the context of contemporary Russian society. 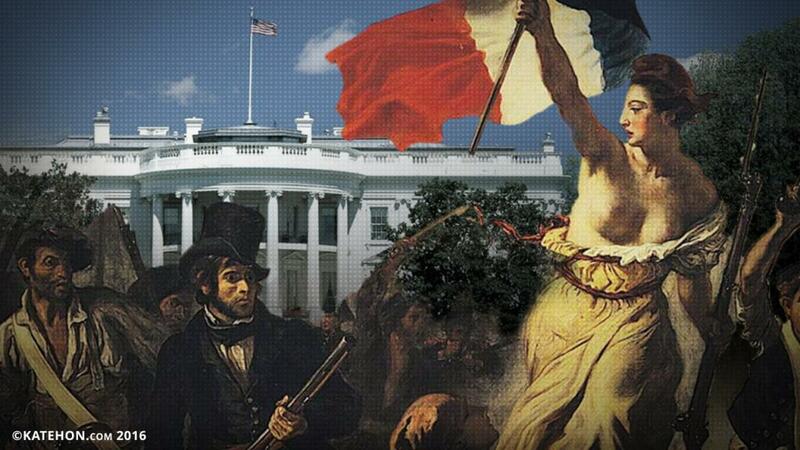 The French Revolution, therefore, continues to have a profound effect upon the current historical moment. This influence is, however, not so simple as citizens in 2016 marching under the banner of liberty, equality and brotherhood, or singing “The Marseillaise”. The equality, or at least the human rights, of gay people is cynically trumpeted by officials who at the same time preside over the slaughter of millions. They manipulate values for political and ultimately economic purposes. The West must address the challenge to its hegemony posed by Russia and China; to do this it must convince the world that it is heir to the French Revolution, that it embodies democratic values. The fact that the United States feels that it must do so, when deep down its elites would like nothing more than to dispense with such pesky appearances, should prove to all of us that the French Revolution’s true legacy must also (along with that of the global antifascist struggle of the mid-twentieth century) be constantly and staunchly defended.